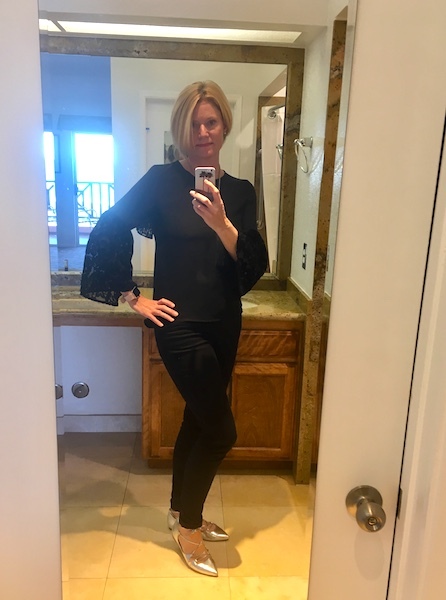 I wore the top for the first time when we did some wine tasting in San Luis Obispo County. It was very windy and cold, and wearing the top with a jacket was a bit challenging. Nonetheless, I am happy that I bought it and that it does remind me of my hometown. Questions: Do you own any bell sleeves tops? If so, what jackets do you wear with them? Or do you stick to vests? I love bell sleeves too, I always roll the sleeves of a cardigan up. Or whatever I wear over a bell sleeve top. I absolutely love the bell sleeves, and I've been trying to cover up with vests when I wear them, so I don't hide the sleeves!!! Such a pretty top Andrea! I love the bell sleeves but I think they're a little hard to wear. I think a vest is a great idea! Thanks, Lana. And, yes, I think a vest works best. I don't own any bell sleeves tops because I don't know how to wear a jacket with it. But I like yours! I think a vest is the easiest way, but rolling up the sleeves is another good option I think. I own a couple bell sleeves tops that I enjoy wearing. I usually wear the with a vest. Yours is very pretty, especially the lace on the sleeves. Thanks, I like the lace details on the sleeves, too. I love that top on you! It's beautiful! I've been wearing my bell sleeve tops with vests if I need extra warmth. Unfortunately jackets don't work that well! I just love this bell sleeved top and the metallic flats with it. I don't think I own any bell sleeve tops, I do have one top with ruffles that cascade down the sleeves... but, I haven't tried it with a jacket yet. I would think a vest would be the best option or alone! This is a very pretty bell sleeved top! I like that the bell is made from lace - so visually interesting. Your silver flats have been such a stylish workhorse in your wardrobe. They look great with everything! Thanks for linking up with Fabulous Friday, Andrea! Love it! I really like bell sleeves and have one embroidered heavy cotton, burgundy, that is just gorgeous. I wear it alone - no jacket, sweater or vest covering it up! Yes, not covering up the sleeves (or other parts of the top) is the best idea!